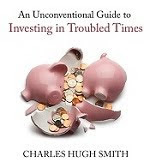 oftwominds-Charles Hugh Smith: What Happens When Cash Is No Longer Trash? Those who actually create value as opposed to chasing yield with nearly-free money will actually have some traction once the swamp of excess liquidity drains. When those closest to the money spigots of the Federal Reserve can borrow billions for next to nothing, cash--laboriously saved from years of paychecks--is reduced to trash. What chance does a saver have in a bidding war for a house or other asset against a financier who can borrow essentially unlimited cash? Answer: none. The saver can leverage his cash at best 4-to-1: a 20% down payment leverages a mortgage of 80% borrowed money. The financier can borrow as much he wants for next to nothing. The saver will lose every bidding war, thanks to the excess liquidity created by the Fed and other central banks. The reason given for this vast expansion of credit is that if credit is cheap enough, people and businesses will put that nearly-free money to work. The problem with cheap credit is that it does not flow to productive investments--it flows to safe yields. Launching a new product or service is risky, especially in a stagnant economy, so the safe way to play unlimited credit (i.e. liquidity) is to chase assets that reliably generate returns. Consider housing as an example. If a saver wants to buy a house to rent out as an investment, he is going to be paying 4.5% or so for the 80% of the money he is borrowing via a mortgage. The rental income has to exceed his costs--the mortgage, property taxes, maintenance, etc.--by at least 3%. Otherwise he might as well buy a long-term Treasury bond and earn the 3% without the risk of vacancies, unexpected expenses like a new roof, etc. Since his mortgage costs 4.5%, the yield has to be considerably higher than 5% to make buying the house a good investment. Let's say the rental has to generate a return of 10% to yield a net return (after paying the mortgage, property taxes, etc.) of 3%. The financier paying less than 1% for his borrowed money has an entirely different calculus. Since the cost of his borrowed money is so cheap, he can bid the asset price up and still earn a return above 3%. Raising the price of the house quickly raises the costs of owning for the saver, as the interest costs of the bigger mortgage eat away at the yield. The financier can raise his bid by 25% and the additional interest on the nearly-free money is trivial. The systemic result of excess liquidity (cheap credit) is bubbles in every asset class that yields a low-risk return. Buying low-yield assets is still profitable if you can borrow money for next to nothing. Though the timing of the collapse of excess liquidity is unknown, we can safely predict excess liquidity will collapse because all extremes eventually revert to the mean. At some point assets reach such heights that even free money isn't earning a real (i.e. adjusted for inflation) return. At that point, participants lose faith in the easy-money policies that have issued cheap credit as the cure-all for stagnation. The excess liquidity is still gushing out of central banks, but even financiers don't want any more as there's no way left to earn a return even with nearly-free money. As correspondent Jay F. observed, the collapse of excess liquidity will be a positive development, as it will restore the equilibrium between cash that is saved and the real returns on assets. "A worthy subject for your attention and treatment is how the collapse of credit liquidity is actually a very helpful thing for individuals who are real creators of real value-- as they now get to compete on a much more level playing field. I see this phenomenon unfolding all around us as overvalued assets and professions go on the chopping block to maintain the status quo. It's actually a very good thing." Well said, Jay. Those who actually create value as opposed to chasing yield with nearly-free money will actually have some traction once the swamp of excess liquidity drains. Thank you, Mark H. ($10), for your most-welcome generous contribution to this site-- I am greatly honored by your support and readership.